When using one antenna for multiple TVs you need to use an aerial splitter to split the TV signal. In the United States we typically use coaxial cable to install TV antennas. I demonstrated this when installing a Mohu Sky 60 and again when I posted how to ground a TV antenna. Depending on your installation you may need to make use of a coaxial splitter to run the signal to various TVs within your house. 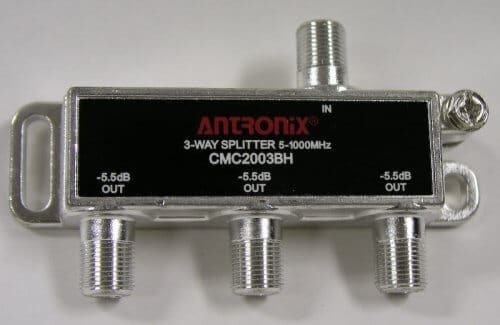 The three things to consider when choosing a coaxial splitter to split your antenna signal are frequency, attenuation (or dB loss), and the number of outputs. Splitters all have a frequency rating. This is shown in megahertz (MHz). It’s a measure of the frequency bandwidth that is able to pass through the splitter. In North America, the highest TV frequency is transmitted at less than 1000 MHz. Therefore the splitter you need should be rated for 1000 MHz in most cases. You can get away with 900 MHz, as long as there is not channel higher than “83” in your area. This TV frequency chart shows that channel 83 transmits at a frequency of 890 Mhz. Many things cause loss to the TV signal, including splitters. 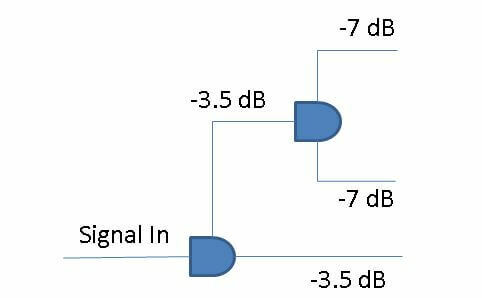 To get an understanding of how a splitter affects your signal, we need to gain a little understanding of what noise margin is. When you use a site like TVFool to gain an understanding of the TV signals in your area, they provide you with a noise margin. I like working with this number because it provides a value that indicates how strong a signal is above it’s operating threshold. In other words, if the noise margin is above 0 after the TV tuner processes the signal, then you can see the picture. Noise margins are typically given in decibels (dB). Decibels are not on a linear scale. They are logarithmic. Therefore when you loose half your signal power the loss is only about 3 (dB). If you are interested on how that works out mathematically, I recommend looking into the half-power point. This is why when you look at a 2 way coaxial splitter you see a loss of -3.5 dB on each port. The 3 dB accounts for the half power loss, and the .5 dB accounts for the loss due to cable connections. When arranging 2 splitters to make 2 outputs you will get 2 outpus with a 7 dB loss and one with a 3.5 dB loss. The reason is illustrated in the diagram below. This brings me to my next point. It’s typically best to use a balanced splitter when utilizing an odd number of outputs. For example, an unbalanced 3-way splitter will have 1 input and 3 outputs. However, the internal workings of the splitter behave as though you’ve connected two 2-way splitters together. Therefore you will see two outputs with -7 dB and one output at -3.5 dB. A balanced 3-way coaxial splitter will show about 5.8 loss across all 3 outputs. Some of the more high end 3-way splitters can get the loss even lower. Now that we understand how the number of ports on a coaxial splitter affects the TV signal it only makes sense not to buy a splitter with an abundance of outputs when you don’t need them. Whether you use all the outputs or not, the loss listed on the splitter is the loss your TV signal will receive. I tend to always purchase balanced splitters with the exact number of ports that I need. When I need to add another line, I simply upgrade the splitter to accommodate the addition number of ports. If you are concerned about dB loss or need to install more than three TVs, you may want to consider a distribution amplifier (pictured below). 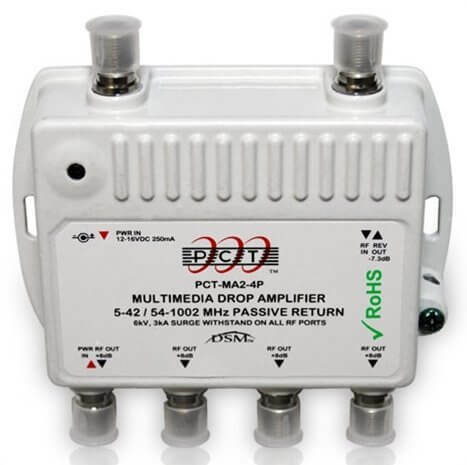 This will not only split your signal, but boost it to compensate for the loss caused by the splitter. Furthermore there is still a gain in signal power coming off each output. On the distribution amplifier I recommend (shown below), there is a +7 dB gain coming off each output. This comes in handy to overcome the noise in the coaxial cable, connectors, and TV tuner (which averages a loss of about 6dB). Be aware that an amplifier isn’t going to boost a signal more than what was received from the antenna. It will only compensate for loss in the line from the antenna to the TV. Furthermore, if a signal is too strong it could have an adverse affect on reception.